The Environmental Protection Agency defines brownfields as "real property, the expansion, redevelopment or reuse of which may be complicated by the presence or potential presence of a hazardous substance, pollutant or contaminant." 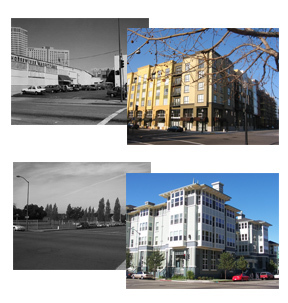 Brownfields redevelopment has transformed blighted, contaminated properties throughout Oakland into safe, vibrant elements of the City fabric. Former Oakland brownfields are now home to thousands of new housing units, tens of thousands of square feet of new retail space and several acres of new waterfront parks and trails. The City of Oakland has been a partner in many of these transformations, and is committed to working with neighborhood organizations, developers and environmental regulatory agencies to build upon these successes. Recent EPA-funded brownfield grant projects managed by the City of Oakland are Coliseum Area, West Oakland and Foothill/Seminary. EPA is conducting a Superfund cleanup at 1414 3rd Street, near Mandela Parkway. 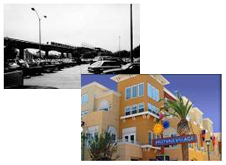 Take a trip through Oakland and visit the numerous brownfield success stories. The City provides written technical guidance and formal institutional controls to assist with the redevelopment of Oakland brownfields. To learn more, read about brownfield assessment and cleanup. The U.S. Environmental Protection Agency offers several grants related to brownfields and many helpful links. Visit the EPA brownfields for more information.